I understand that the Epimetheus pass on Sunday 6th December 2015 will be a close one, approx 3,000 KM? If so the ISS NAC may resolve details to approx 3 metres ??? Absolutely astonishing imagery. Really enjoyed the E20 images too of the north polar region too. On image: http://saturn.jpl.nasa.gov/multimedia/images/raw/casJPGFullS91/N00250525.jpg is that a crescent Epimetheus to the lower right? What is obvious are the number of impact craters, at least three with central peaks. This area looks more like the Jupiter moon Callisto, Saturn moon Rhea or Uranus moon Umbriel, with liquid hydrocarbons filling some of the colder hollows and craters. Will be interesting to see some more recent SAR imagery of this area. I wonder what that narrow rille actually is? Perhaps a boundary of two layers of ice??? What you want to do is rotate that amazing image 90 degrees to the right or clockwise. It is stunning, looks like that you are not far above that ancient, cratered surface. It is a lovely perspective image too. That image is not grainy then, it is very sharp indeed. Do we know what the resolution is or what the actual dimensions are shown there? I wonder if Cassini could capture Mercury, Earth (again) & Mars???? Fantastic set of images of Helene. Do we know if the surface is dust covered or comosed of icy grains, possibly sourced from the geysers of Enceladus or Saturn's rings in general? Also Helene is only slightly larger than the Mars moon Phobos. Helene generally lacks impact craters accenpt for the side that is leading. Phobos seen at this resolution would be heavily cratered & grooved. Helene appears to lack both. Perhaps Helenequakes from impacts triggers these landslides & erases craters??? 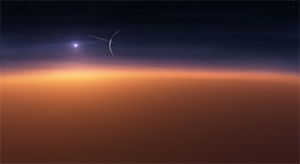 The surface gravity cannot be any more than 1/1,500th that on Earth. Another interesting mug shot of Helene, the leading Trojan moon of Dione. Helene is only 36 KM by 32 KM by 30 KM in size, where as Dione is 1,123 KM wide!!!! Mind you the trailling trojan moon Polydeuces is much smaller again, perhaps only 3 KM wide!!!!!!!! What is interesting to see is that the three trojan moons seen up close to date (Helene for Dione as well as Telesto & Calypso for Tethys) is that thet all have smoother profiles & certainly Calypso & Helene display flow like features. Are they sweeping up ice crystals ejected from Enceladus's geysers??? The Herschel Crater seen in profile to the bottom left paking that part of Mimas appear flat is interesting. I think the summit of the central peak can just about be seen, suggesting to me that the central mountain is taller then the rim. Also the terrain far to rhw east has not been very seen very well, so this is an interesting observation to help understand that area well. Just to say that around perikrone today, there was a non targetted Mimas pass, as well as that of Enceladus & Helene shortly after. Looking forward to seeing those images, Cassini did not pass that close to any of them, but more than close enough to reveal much new data & views from differing vantage points, than ever before. Absolutely, fantastic image. Also because their distances from Cassini were not that much different, the small difference in size is apparent. Dione @ 1,123 KM wide & Tethys @ 1,063 KM wide. Mind you Dione has nearly twice the mass of Tethys due to it's much greater density & also Tethys appears unevolved & primitive, where as Dione has certainly seen much geological activity in the relatively 'recent' past & may still be active on a small scale. I agree with you, many of those craters are very Mimas like. I still think that Rhea is very unevolved, one of the largest, in fact potetially the second largest unevolved object in the entire Solar System, only the Jupiter moon Callisto taking # 1 in that list. The similar sized Uranus moons Titania & Oberon are certainly far more evolved than Rhea, Titania has huge graben, possible frosting & a large smoother region with smaller & softened craters & Oberon although cratered, shows signs of cryovolcanism with many craters having dark floors, at least on huge chasm, many craters appear 'softened' like Enceladus, Dione, Miranda, Ariel, Titania, Triton & Ganymede, worlds that have been & some may, in the case of Enceladus & Triton still are geologically active. Rhea shows none of that, a surface that is practically craters on craters on craters. Some faulting is present, but how much of that is due to the Tirawa Basin forming event or other impacts, remains to be seen. Rhea is certainly a relic from the earliest days, much to tell us about the history of the Kronian system ,regarding the environment this far out from the Sun & cratering rates of the Kronian system from the period shortly after the formative period. Rhea is fascinating, not so much because of Rhea itself, but because of what Rhea can tell us about the history of the Kronian system as a whole. Iapetus is another moon interesting for the same reason, aside from the huge mountain ridge, little else appears to have happened there either, Mimas too. Rhea is extremely photogenic too. It's an amazing surface visually, craters of differing shapes & sizes, some regions eppear more hilly than others, etc. Yes they are Cosmic Rays @ the lower left. Yes I agree, Hyperion is very curious. One idea is that the deep fluted craters are due to normal craters being deepened by the dak dusty floors absorbing what little sunlight is out here & 'burning' a deeper hole, giving Hyperion the peculiar sponge like appearance. Also Hyperion is the least dense 'solid' body at only 0.55 Gcm3, just over half that of solid H2O ice, suggesting that Hyperion is an icy rubble pile held together by gravity. Certainly sopme asteroids are like this, main belt asteroid 253 Mathilde certainly so, rather carbonaceous materials rather than ice, the Mars moon Phobos (possibly Deimos too) & the Jupiter moon Amalthea. Phoebe appears coherent as does the main belt asteroid 21 Lutetia, so not all 'small' bodies are rubble piles, but Hyperion almost certainly is. Whether or not Hyperion is a captured comet is open to question, where as Phoebe most certainly is. Shame we cannot get another close pass of Phoebe, but I think we will see Hyperion again with Cassini. Do we know when yeaterday's Rhea imagery will be avaliable? Hope Cassini has not gone into safing. Do we know what the closest approach distances will be to Daphnis, Pan, Pandora, & Dione during rev 142? The 110 x 88 x 62 km sized moon Pandora in earlier images on: Monday 5th September 2005, show a large, deep crater that to me looks a little like the deep ones on main belt Asteroid 253 Mathilde, impact into a low density body. Lovely image & fantastic perspective too. One thing immediately obvious to me anyway, not just Erulus Crater is that, a similar view of Tehtys & Rhea would be saturated by small craters. Dione seen here is not. There are some small craters for sure, bet the terrain generally looks 'fresher' & more evolved. Erulus Crater itself has an interesting central mountain almost Y shaped, certainly obvious on other images taken from further away. More like two ridges in the centre of the crater rather than your typical central crater mountains, like those in the lunar crater Copernicus or the Mimas crater Herschel. Iapetus too shows a few craters with central ridges rather than mountains in the normal sense. Wonder if Dione has an exosphere like the one recently announced at Rhea?? Dione may still be geologically active on a small scale & certainly apart from Titan & Enceladus is the most evolved of Saturn's moons. Just to say everyone, Enceladus images coming in now from yesterday. Still like these Hyperion images though too. Most definitely. Lovely series of Hyperion images. Hyperion has had virtually no attention in the extended missions, so it's great to see some new decent material concerning this large strange icy object. I am sure that with this set, we have some decent observations from viewing angles not possible before, i.e in September 2005, the only really close approach. Rhea's average surface temperature is so low, approx minus 180 Celsius, that Rhea can hold onto an exosphere. It is not really an atmosphere per se as it is far too tenuous, approx one in five trillionth of the Earth's atmospheric pressure at sea level. However it is a concentration of Oxygen, I guess Atomic Oxygen rather than molecular Oxygen (O2) or Ozone (O3) & CO2. However the pressure of this exosphere is lower than a good laboratory vacuum. I expect the oxygen is liberated from the ice by irradiation from Saturn's magnetosphere ( I suspect Rhea may also be emitting Hydrogen) & the CO2 may be from outgassing & /o or irradiation. With Rhea it is not obvious as so far the surface appears to lack geological features other than a few faults. Unlike Dione & Enceladus, which certainly show 'recent' geological activity & in the case of Enceladus is certainly ongoing, Rhea appears to have had nothing happen other than get hit. Images particularly from Voyager 1 & Cassini show craters upon craters & gravity data suggest an undifferentiated interior. Further work will have to be done to examine the data & see whether or not possible sources on the surface of the large icy moon can be found. Also it has been suggested that the Uranus moons Titania & Oberon could have exospheres too, as they are both more massive than Rhea & Titania is slightly larger (Oberon is slightly smaller but is denser than Rhea). Unlike Rhea, both Titania & Oberon clearly show signs of having geological activity in the past from Voyager 2 imagery. Another thing I have seen with my own enlargements of Daphnis is that Daphnis appears to have a 'large' crater, approx 2 KM wide on a 9 KM long body. Wonder if this shows that Daphnis is an icy rubble pile held together by gravity (a more solid body would shatter)??? Main Belt Asteroid 253 Mathilde has been seen to have huge deep craters & Hyperion too has deep craters & both objects have been found to have very low densities. Reminder the ESA Rosetta Spacecraft encounters the large Main Belt Asteroid 21 Lutetia on Saturday afternoon (UTC). Love these, we get to see the shape of Daphnis at long last :) Like the high res views of the rippling, but to see Daphnis as other than just a dot is really something. Lovely bit of geometry to capture these co orbitals like that!!!!!!!! Just as a reminder everyone, I am sure Carolyn is also very interested, a week today (Saturday 10th July 2010) the ESA spacecraft Rosetta passes approx 3,160 KM from the large Main Belt Asteroid 21 Lutetia, approx 132 KM by 95 KM in size. The best images will have a resolution of approx 95 metres. 21 Lutetia will be the first ever large asteroid seen up close. I will be posting the images up live as they are released later that day on Space.Com & will link to TWITTER. WOW thanks Carolyn. Fantastic, love this image. What is nice is that both Pandora & Janus display shapes & surface features & the rings highly foreshortened. Wonderful & we have the potential of at least another seven years of these wonders. I hope ARGO / New Horizons 2 will be approved, a Jovian asteroid 5638 Deikoon, utilising a Saturn system encounter (first close Saturn & Titan obs post Cassini), Neptune & Triton (first close ups since Voyager 2)& the KB. It looks like tectonic 'slabs' where oder terrain abuts more tectonically disrupted terrain. I understand that no cryovolcanic flows have actually been seen, but the huge numbers of boulders seen in the very sharpest images reveal massive grinding action of icy plates. We may see similar on Dione & the Uranus moon Miranda & maybe Ariel too (both extremely well seen to orbiter quality by Voyager 2). Lovely, I worked on some sharpened enlargements of this & neibouring frames & are on space.com. Shows highly geologically evolved Dione sliding in fornt of the complex rich chemistry of Titan's hazes. Quite a picture indeed. Although Phoebe orbits Saturn in a retrograde direction, looks like the rotation on the axis is prograde. Will be very interesting indeed to compare the fantastic Cassini Phoebe encounter with the New Horizons imagery & spectra of the Pluto moons Nix & Hydra (though Phoebe is very much larger than both). I still reckon Cassini beat New Horizons to imaging a KBO in close up. Unless we think Triton is a captured KBO by Neptune, then Voyager 2 wins. Eris, Triton & Pluto (that order of descending size & mass), still to me appear to share a common origin in the Kuiper Belt, just that Eris & Pluto are the largest. Does Phoebe share a common origin too with them?? Oberon is clearly denser & also the best Voyager 2 images of Oberon clearly show that Oberon has experienced cryovolcanism with dark flooding of crater floors & also Oberon shows evidence of lofty mountains, both of which Rhea lack. Looks like more has happened with Oberon, geologically speking than Rhea, though we won't know much more till there is a return to the Uranian system. Rhea does seem very dead considering it's quite large size, but Rhea's density does appear lower than both Titania's & Oberon's & both Titania & Oberon show evidence of having had activity, something sorely lacking with Rhea. However Rhea does record the impact history of that part of the Saturn system very well. Another nice astronomical shot from Saturn orbit by Cassini. The Pleiades / M45 show how good Cassini's ISS is. Very familiar with this cluster in Taurus, but it seems strange that they are imaged here from a Saturn centric orbit. Noticed that the Pleiades have been imaged again on Sunday 3rd February 2008, from Cassini. A very good test of imaging systems. Also the Pleiades / M45 had been imaged by the Mercury bound MESSENGER spacecraft, just prior to the second Venus encounter & also by the Mars Exploration Rover A Spirit, from the Gusev Crater on Mars. So this very familiar star cluster has been imaged from through out much of the solar system. Thank you for your observations. Yes the similarities in the form of the ridges between Enceladus & Europa are striking. But let's not forget. Europa is approximately 500 times the mass of Enceladus & the situation both are in are very different. We have seen activity at Enceladus but none as yet on Europa, the role of liquid water is suspect to say the least, as liquid water under the surface has not been conformed, just theoretical. It certainly looks like cryolava has oozzed at first glance, but so far no cryovolcanic flows have actually been seen on either. Even other suspect objects having shown considerable activity like Dione, Ariel & Titania, everything seen can be explained by tectonism, rather than eruptions. I think these are cryovolcanic constructs myself, but so far the images are not conclusive. Sippur Sulcus on Ganymede does look like as though cryolavas have flowed. What would be interesting, would be to map the orientation of the fractures & compare the fractures here with the ones on Europa & also the rupes on Mercury, to see if the patterns are alike or very different. Very well done indeed. I knew you did it & this is the proof in the pudding. It really looks like as if the ice is slightly compressed forming the low ridges & some how many ice boulders are present. How come they are on top of the ridges seems mysterious. I am aware that boulders can form due to grinding within lateral faulting, impact ejecta, etc, but these seem out of place???? Or perhaps the narrow fractures running across the ridges are enough? Nice image of the First Quarter Dione. Great to see that Dione is included as a primary target within the Extended Mission. I know we often here of Titan & Enceladus, rightly so, they are both active worlds, but Dione also is one of Saturn's most interesting moons, clearly been very active & is maybe still so on a small level, with a wide range of surface features & appears to be differentiated. A very good, excellent choice for a close pass during this extended mission. Very nice view, similar to how Dione would look from Saturn with a small telescope!!!!!!!! Do we know when the close pass will be? WOW wonderful view. Looks more like Jupiter in some respects with those giant storms. I assume they are producing lightning? One question. Has Cassini imaged lightning over the nightside as the Voyagers, Galileo, Cassini & New Horizons did with Jupiter? Anyway, fantastic & incredibly beautiful. Saw this once before as a shadowy noisey raw image. It's great to see that some of the smaller moons are also being researched like Hyperion, Janus, Epimetheus, Helene, Telesto, Phoebe, etc. Wonder if Janus is like Epimetheus, an icy rubble pile held together by gravity? Does anyone know when the Helene encounter will be? Is there any chance of a close passes of Calypso, Telesto (again) Polydeuces, etc? Ten metres per pixel. Ice boulders, small valleys, much, much activity here, just incredible, thank you so very, very much. Very well done to ALL involved. I bet you are very proud Carolyn. You should be. I am certainly looking forward to this very much. Also it looks like we get to see the images fairly quickly, within 12 - 14 hours? Fascinating, just what does Cairo Sulcus look like at 7 metres resolution & even the terrain between the sulci??? Ice banks? Ice blocks & ice boulders???? Perhaps I was a bit blunt, but also perhaps I did not put my point across very well. Yes, it's true that Tethys & Rhea do not have the geological impact that Titan, Enceladus, Dione & Iapetus have, & visually, yes, it's craters on craters on craters. But yes also, they record the pasdt environment better than the active or recently active moons a lot better, as geological activity erases what's there before, so Tethys & Rhea are a huge bonus in this respect of recording what has happened within the Kronian system as a whole. So yes I am very pleased to see that they are ALL being mapped properly now. Perhaps rather than boring, Tehtys & Rhea are probably the simplist large moons in the solar system. I think perhaps only the Uranian moon Umbriel out of the other large solar system moons is as simple?? I agree also with you on this bruno. Compared to Enceladus, Dione & Iapetus, Tethys does come over as a bit of a bore. True Ithaca Chasma does offer something else, but really there appears to be little else of interest. There appears to be a smoother band around the equator, but even that is craters on craters on craters. IMO Rhea & Tethys are among the most boring larger moons in the solar system. Their saving graces may be they record the environment of the conditions within the Saturn system over the last 4.56 GYrs. It is good to see though that they are all being properly mapped. This is fundamental in understanding the evolution of the Saturn system. I've researched what the background sky was, forming a backdrop for Tethys. This image was obtained back in June on the final day of the Primary Mission of the Cassini Spacecraft, which has now been extended to Wednesday 30th June 2010. Tethys is seen here, in the shadow of Saturn, but dimly lit by reflected sunlight from Saturn's rings & other moon. Dione is off the frame to the bottom left & I wonder if Dione is responsible for most of the weakillumination of Tethys? The stars in the background ar within the far north of the constellation of Bootes close to the stars Merez / Rho Bootis & Upsilon Bootis. The red giant star Arcturus / Alpha Bootis is way out of the frame to the lower right. I really hope we get to see a lot more of these sort of obervations. I thought that the Ithaca Chasm was formed when the crust froze as hard as rock quickly, but the interior froze more slowly, expanding slightly as it did so, causing the crust above to crack open, forming this enormous canyon, just like a huge graben. In that case, Ithaca Chasm & the Odysseus Crater are not related. Or am I wrong now, with new information made available by Cassini? I have studied many images of Ithaca Chasm, looking for evidence of cryovolcanism, but have found none. To me Ithaca Chasm just looks like a gigantic, ancient, beaten up, cratered graben. I am very pleased that Dione has mapped in such detail & these maps have been released. Great stuff. Dione is definately one of Saturn's most interesting moons. I am looking forward to the same for Enceladus & Iapetus too. There would be no doubt that the lightning in all four of the outer planets (Jupiter to Neptune) is generated by the charge generated though ice crystals, as on Earth. The uncertainty lies with the exact mechanism of how internal heat particularly with Jupiter, Saturn & Neptune convects the atmosphere & the relationships with the ice & other compounds, how they may contribute to lightning generation. Almost certainly Jupiter, Saturn, Uranus & Neptune have rain, snow & hail, possibly giant hail (I saw something once that suggested that Jupiter, Saturn & Neptune could have hailstones the size of footballs, don't know if that is still thought to be so). The Galileo spacecraft saw thunderheads rise 50 KM or more above the general cloud deck in Jupiter's atmosphere. Don't know about Saturn, although with Saturn, the thunderheads should rise even higher due to the much weaker gravity, unbless the updraghts are weaker than Jupiter's. Very nice image of Dione. Even in Saturn-shine on the night side on the large ice covered moon, a wide range of surface features are visible, displaying a dynamic past on Dione, one of the most interesting of Saturn's moons. The overexposed day side will be ideal to search for possible geysers on the limb, a long shot I know, but worth a try. Your idea backs up my impact theory. There is nothing seen in either the images or during the data release a few days ago, that suggests otherwise. I reckon all current activity on Enceladus is fossil heat from a very large impact, in the very recent geological past. The Tiger Stripes to me looks like skin on paint in a paint pot with no lid hardening, or in this case, ice slowly freezing over a huge impact basin. Beneath the fresh ice layer, there may be liquid water, in fact I think it is certain that there is liquid water, but is only a temporary phase, before the whole lot freezes solid, all the way down. Some tidal heating is possible between Saturn on one side & Dione on the other, but in all fairness, Enceladus is really far too small to be affected greatly by such a situation. I think we are looking at a major impact scar healing over. The softening of northern craters, probably reflect heat through shockwaves from the impact. Very nice image of the large ice moon Dione. Like Enceladus, Dione is the scene of very many differing processes. The wide deep Graben at the bottom of the image, do seem to be the result of internal geological activity, not impact related. Did the ice mantle expand slightly here, causing the brittle ice crust above to crack? Perhaps future encounters with Cassini or a future Saturn, Titan, Enceladus spacecraft could swing by to take a look, will reveal cryolava flows on the floors, or the floors have just sunk (more likely). The surface between the Graben & the terminator at the 4 to 5 O clock positions appears much smoother & less cratered then much of the rest of the hemisphere visible here. Perhaps cryovolcanic resurfacing, maybe related to the Graben? The bright streaks coming from the 10 O'Clock position, does look like impact ejecta, coming from a point over the limb. Dione is certainly one of Saturn's most interesting moons. Yes the left hand 'crescent' lit by Rhea & the right hand 'crescent' lit by Tethys & Dione are quite easy to see, despite the bright 'gibbous' from sunlight reflected of Saturn's rings. So clearly Enceladus is still being lit by reflected sunlight from several objects within the Saturn system & the double northern horns of the opposing crescents is interesting. Really quite eerie & alien. On a few of the raw images are showing the eclipsed Enceladus in front of the trailed stars of the Camelopardalis / Ursa Minor border, whilst Cassini tracked the eclipsed ice covered moon. Is it true that this image was obtained whilst Enceladus was in eclipse by Saturn's shadow & Enceladus was illuminated by reflected light from Saturn's rings? I wonder if the active area in the south is a remnant of a giant impact basin? The area & striation seem to be circular around the curcumferance, with the Tiger Stripes, looking like hardening skin on paint in a paintpot with no lid? The cratered north to me does not look primeval, yes there are a lot of craters, but they are softened, like many on Dione, Jupiter's Ganymede & the Uranus moons Titania & Oberon, certainly being cryovolcanic bodies in the past, until fairly 'recent' times geologically speaking. The sharp demarkation between the cratered & 'newer' terrain you picked up on, seems to suggest to me that the ice crustal thickness, increases suddenly from south to north, perhaps also an impact consequence? The neighbouring moon Mimas was nearly destroyed in the collision that created the Herschel Crater, but then Mimas is near enough pure ice, that was brittle. Enceladus being composed with a larger amount of rock, perhaps even differentiated behaved differently, the huge impact scar, filled with cryolava instead, creating this weird surface & dichotomous morphology? Just to say, the images are coming in. They can be seen on the regular Cassini / Huygens NASA / JPL site in the Raw Images. I strongly suggest that you all go & take a look. They are absolutely incredible. The ones after closest approach are showing a very reworked, resurfaced icy object, with a large canyon coming into view @ the Nine O' Clock position. The crescent Encleladus pre closest approach, show a more heavily cratered, older surface, in fact Enceladus looks like two very different objects, dependent on wheter you are looking 'down' onto the Northern Hemisphere or 'up' at the Southern Hemisphere. Dione also, shows something similar, though not as dramatic. However the craters do look a little softened, not hard like Rhea, but softened like many on Dione or the Uranus moons Titania & Oberon. What a week this turning out to be. Ring around Rhea, close brush past Enceladus next Wednesday. I too am wondering about Rhea's ring. Could it have formed from ejecta from the Tirawa basin?? What resolution will the sharpest images be, before they smear due to the speed of the encounter? I remember very well, the Galileo spacecraft being sent through the Thor volcano plume on Io. The same concerns then were expressed about partical size & it turned out the sulphur dioxide particles were microscopic & Galileo came through just fine. I'm sure the same will happen with Cassini with Enceladus cryovolcanic particles. Yes, the northern Spring Equinox is approx 21 months away (December 2009). Also the ring shadows are narrowing & are closer to the equator. The salmon hues are definately replacing the bluer ones. Hopefully, we will see the far southern latitudes turn bluer & the shadow rings cross the equator & widen in the southern hemisphere, from 2010 onwards. It is so interesting to see how different the individual moons are within a particular system. With Saturn's system, the difference between Titan & Mimas is most striking. Phoebe almost certainly is an interloper from the KBO, Hyperion is just odd, Enceladus, highly active, Dione also probably moderately active, Tethys, Rhea, & Mimas as dead as door nails. Iapetus is extremely fascinating for other reasons. I suspect the Uranian moons had more radiactive elements & it is interesting to see, how much denser Titania & Oberon are to Saturn's similarly sized moons Rhea & Iapetus. Clearly the Saturn & Uranus systems have evolved very differently. I like your comparison of the differences between Io & Callisto in the Jovian system. True, Jupiter's immensely gravity & tidal influences have much to do with this. Even so, Io is poor in volatiles, but heavily differentiated & contains a large amout of heavy materials (Io has the highest density & surface gravity of the solar system's moons). Callisto appears to be a mixture of rock & ice, with a slight concentration of rock towards the centre, but not enough to form a core. Probably much like Rhea, which appears to be much like a smaller Callisto. Maybe the fact that Rhea is not so 'hemmed' in as the inner Saturn moons, but I still cannot help but think the Rhea's lesser density & over all mass than the Uranius similar sized moons may have something to do with this also. Like Titania & Oberon are nearly 20% more massive than Rhea, yet despite being of very similar sizes. I wonder if Titania & Oberon may have had more in the way of radioactive elements in their youths than Rhea also? I think this will only ever be answered when a Uranus orbiter arrives in Sector 7 & closely rendezvous with them. Of course, it is true that rhea may have had its original features erased with subsequent cratering. What would help, would be if Rhea's gravitaional field was measured to determine if Rhea is differentiated like Titan & Ganymede, or is homogenous like Callisto? In an Icraus abstract I found, the gravity data did suggest that Rhea is more like Callisto, virtually no rock in the outer lars, but slowly incraesing towards the centre, but not forming a well defined core, so in effect Rhea appears undifferentiated. Rhea is far too massive to be pure ice, but the density fits in well with roughly two thirds ice, one third heavier materials. Titania & Oberon on the other hand appear to be almost 50 / 50 rock & ice & I think that this has a huge bearing on what happened & they unlike Rhea, do appear to be differentiated, which may explain the greater geological variety that Voyager 2 saw whilst traversing Sector 7. I suspect in the case of Rhea, it is lighter less space weathered ice being deposited over older more space weathered ice. Rhea appears to have had no internal geological activity, the entire surface appears to have been effected by impact events. I use the word appears, as in the images I have & have seen, can see no evidence for anything else other than impacts. Many of Saturn's moons appear to have had varying degrees of geological activity to varying degrees. Dione: moderate overall, extensive in a few locations. Iapetus: Some, the giant equatorial ridge of the Voyager Mountains. Tethys: Little, smoother equatorial regions, Ithaca Chasma, little else. Rhea & Mimas: None as far as I can tell, only impact cratering. Rhea appears to be a bit of an odd ball in this respect. Rhea is a large object that appears to have had little other than impacts happen to it. Rhea is similar in size to the Uranus moons Titania & Oberon, as well as Iapetus. Comments: Giant canyons, smoother subdued craters in places, possibly previous cryovolcanism, possibly very tenuous atmosphere. Rhea: 1,528 KM. Second largest moon of Saturn. Density: 1.33 Grammes cm/3. Comments: Little has happened apart from impact cratering. Oberon: 1,522 KM. Second largest moon of Uranus. Density: 1.64 Grammes cm/3. Comments. Like Rhea has experienced extensive cratering. Unlike Rhea, has tall mountains & has had experienced cryovolcanism & like Titania possible limited tectonic activity. Possibly a very tenuous atmosphere. Note Oberon's average diameter is only 6 KM less than Rhea's, but is somewhat more massive due to higher density. Iapetus: 1,436 KM. Third largest moon of Saturn. Density: 1.21 Grammes cm/3. Comments. Odd ball moon. Dark leading, bright trailling hemispheres. Huge equatorial mountain range, some peaks almost as tall as those on Mars & Io. I suspect Rhea's lesser density (greater ice to rock ratio) may explain lack of geological activity. The northern cloud appears to be a semi permanent feature. I reckon it to be from condensation from the hydrocarbon lakes & from the slighter colder polar region, which is slowly coming out of Winter into Spring (Titan northern Spring Equinox in August 2009, four months prior to Saturn itself). Hopefully, we get the mission extensions, to partly monitor this & see if the lakes in the south fill up as Titan southern Winter arrives there. I agree with you about the nonsense regarding the Plutonium issue regarding Galileo & Jupiter. I was aware of certain elements against that plan for the fear of Jupiter becoming a second Sun due to Galileo's RTG. It was total nonsense back then as it is nonsense that Cassini will do that with Saturn. Gort asked a good question as he / she was not probably not aware of the non issue involved, perhaps heard scare stories from somewhere. I responded saying that Cassini cannot initiate thermonuclear synthesis within Saturn. Cassini will not last more than seconds after atmospheric entry, will be incinerated as a shooting star in Saturn's highest atmosphere. I was aware that Pu238 is the wrong isotope for nuclear fission. It is the heat from its natural decay that is powering Cassini. It is not even a nuclear reaction at all & that the RTGs are NOT nuclear reactors. I was not aware that even the first mission extension was not yet approved. I am sure & hope that it will be granted. The second one should also. I agree with you 100%, that the Kronian Solstices would be of very scientific value, if Cassini is still operational & controllable then. Like the recent Janus & Titan images. Although still iregular in shape, Janus appears more 'regular' than co-orbital / orbital swap mate Epimetheus. Wonder if Janus's larger size & mass are responsible. Primary mission still up & Cassini still performs as well as when had just arrived. I am sure mission extension will happen. I would not worry about the Plutonium. Firstly if you are worried about the Plutonium creating a Hydrogen bomb out of Saturn, no worry. We are dealing with only a few KG of Plutonium, against Saturn's trillions & trillions of tons of Hydrogen. Secondly, Cassini will not penetrate far at all. The Cassini Spacecraft will be vapourized as a meteor soon after entry into Saturn's atmosphere, in the Ionosphere, will not even reach Saturn's Stratosphere, well above the clouds. By the way Cassini is performing, I really think 2017 will be possible at the Saturn system northern Summer / southern Winter Solstice. Will try & find the actual date. 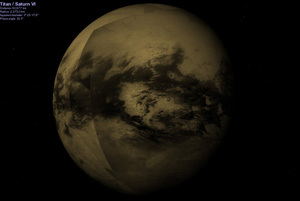 For Titan will be about four months earlier. It is not easy living with my condition. Mostly it is the fear of keeping up my lifestyle without falling to dependence & the fear of unexpected situations rearing up. In other words, I'm often living on my nerves. I am very happy to have been acepted so readily into the Alliance. Thank you all very much. Just hope that I can contribute effectively. The Enceladus post equinox encounters will show if the southern polar 'tiger stripes' will remain active. If not then we can say categorically that the cryvolcanism on Enceladus is solar driven, like Neptune's Triton or even like a gigantic comet. I suspect though, that will not be the case. I suspect the 'tiger stripes' are permanently active, with tidal flexing generating frictional heat within those faults. I suspect a similar thing is happening on a much lesser degree on Dione & the Uranus moon Ariel. I doubt that Enceladus would contain enough radioisotopes to generate the necessary heating. So I do suspect it is tidally induced. I also hope we get to SAR most of Titan with this plan & still get to have at least one more very close Dione encounter, though I can see why Titan & Enceladus would get first pickings. Once again, thank you very much Carolyn. 3488 is strange, I agree completely 100% with you. No secret I'm happy to explain. Due to my troubled youth with my condition (High Functioning Autistic), it was thought that I could never live outside of sheltered housing. Well I proved them all wrong. Got my own flat & 3488 was my first ever PIN for my bank account, so that number has real significance. Not only that it is easy to remember & as there is no other 3488 on any message board on the web, I am easy to find. I like the idea of placing Cassini inside of the D Ring. A variant if possible, could Cassini be placed into a very close polar orbit around Saturn? Twice each orbit the rings would be approached very closely, enabling high resolution imaging, both back & front, whilst global weather monitoring would be doable. A bit like the JUNO mission to Jupiter & would be able to compare JUNO results directly with Saturn. I still aim for the Northern Summer Solstice though with the mission carrying on as is. Hopefully we will still get many more Titan, Enceladus & Dione encounters in. Shame we cannot revisit Iapetus & Phoebe due to DeltaV issues (it would be scientifically very valuable to encounter ex KBO Phoebe again, but with the opposite side facing Cassini at closest approach). Are we likely to get a very close encounter with Mimas & / or Janus, Prometheus, the Dione & Tethys co-orbitals? It is great talking with you. Thank you very much, I did wonder if Iapetus would require too much DeltaV? I know it is early days yet (Cassini has still got years left), but a USEFULLY scientific end to Cassini's mission in my opinion is justifiable. Instead of just sending Cassini into Saturn (unless it is a day side approach with images being taken & transmitted in real time of the kronian weather systems), I still say an impact on one of the moons would be far more useful. Dione or Hyperion perhaps? Images being taken & transmitted in real time, remeber the NEAR / Shoemaker landing on asteroid 433 Eros? Or a complete radar mapping of Titan, with Cassini entering a polar orbit around the giant hazy moon & SAR the entire globe, like Magellan did with Venus? I know, it is just ideas, but this board allows for ideas to be shared, how unlikely or likely they are to succeed. Unfortunately, this is something that we all here on at the CICLOPS Alliance, who care so much about this mission will have to face one day with Cassini. I admit, I was so upset when the Galileo mission ended, Cassini will be no different. Did not realise that Cassini could still be operating for SO long. When Cassini looks like the end is coming, could we impact the spacecraft on Cassini Regio on Iapetus? Reasoning, being that a fututre Saturn / Titan mission could pass close by to Iapetus & image the impact crater to see how quickly that dark brown 'crud' darkens the freshly exposed ice. 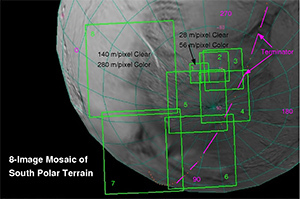 Also Cassini could take images & transmit them during the approach. Just an idea. Also these observations are important regarding the meterology of Saturn in the far north. 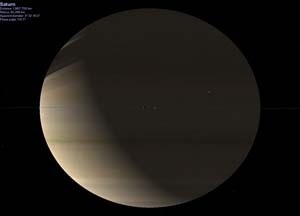 The northern Spring Equinox on Saturn is in December 2009 & Titan's will be in August 2009. The four month difference being due to Titan's very slightly inclined orbit, hense the equinox for Titan is four month's earlier than Saturn's itself. Whether or not Cassini will still be operational, so long after the end of the primary mission, remains unknown, but in the meantime, it will be interesting to see how the far northern latitudes respond to the change from Winter to Spring. How long before the orange clouds reform in the north polar region, as the cooling effect of the shadow of the rings wane, etc. Will more storms form, this will tell how much they are effected by solar radiation (only about 10 watts per square metre), verses internal heat. Likewise important to see how the far southern latitudes respond to Summer turning to Autumn. Will the cooling effect of the ring shadows, turn much of the southern hemisphere blue?? A distant but still a nice view of the very interesting Saturn moon Dione. I am currently doing a project in my spare time comparing Dione with the Uranus moon Ariel. & both may stil be active in a small way. Many similarities have come to light. Both appear to contain approx 50% ice / rock. Both have similar densities: Dione: 1.5 g cm/3. Ariel: 1.6 g cm/3. Both are very simialr is size. Dione: 1,118 KM across, Ariel: 1,158 KM across. Both have canyons, although Ariel's are wider, but both moon's canyons are of a similar form & alignment characteristics. Ariel has tall mountains, where as Dione does not. That is one fundamental difference between the two. Both have however smoother areas with smaller craters as well as more primitive areas that are more heavily cratered. The Dione from above image will help in my 'research'. I've sometimes wondered about this also. Hyperion is the least dense of the known solid bodies in the entire solar system, only 0.55g cm3. This suggests a rubble pile held together by gravity & / or a more coherent body with huge internal voids. My bet is the rubble pile. Like polystyrene, it is possible to punch deep but narrow holes in it. We see similar here on Hyperion. I had seen one suggestion bantered about elsewhere (not my idea), that Titan formed in a heliocentric orbit at one of Saturn's lagrange points & over time, Titan was drawn towards Saturn. 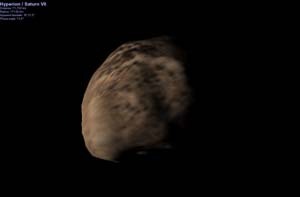 Hyperion was suggested to be Titan's former moon. The mass ratio between Hyperion & Titan is identical to that of Dione with Polydeuces & Helene as well as Tethys with Telesto & Calypso. These facts were part of a thought exercise elsewhere. Hyperion being a former comet is an interesting idea. Remember that Phoebe is almost certainly a captured comet / KBO. Also remember the floors of these deep craters are dark, so they absorb the very little solar energy there is & can burn through the ice. I am sure there are a whole multitude of reasons for Hyperion's weird situation. A most fascinating object. Note how the ring shadows are continuing to narrow & how far north we can see now, as the Spring Equinox is approx 22 months away now. The storms in the far north look pretty large. Any ideas of wind speeds & temperatures, whether or not they are Sun induced (probably not). It is most fascinating to be able to observe Saturn with Cassini during an equinox. Sorry for my dreadful typo everyone, I meant the DAWN spacecraft, not GAWN (stupid me). Hyperion is certainly one of the most iregularly shaped objects yet seen closely by spacecraft, with the possible exceptions of asteroids 243 Ida & 433 Eros. The Neptune moon Proteus is sort of squarish or cuboid with rounded edges, really quite strange. I forgot the KBO 136108 2003 EL61, a very large 'cigar shaped' icy body (1,950 KM x 960 KM). In addition to 2 Pallas (570 x 525 x 500 KM), we also have 4 Vesta (575 x 560 x 460 KM). However Hyperion is far more out of round than either 2 Pallas or 4 Vesta. Very interesting topic this & Hyperion remains the largest seriously irregulalrly shaped object yet seen up close (had the Galileo spaceraft launched in May 1986, we would have seen the very large main belt asteroid 29 Amphitrite in close up). I think the Neptune moon Proteus is the largest confirmed irregularly shaped object in the solar system. Main belt asteroid 2 Pallas (570 X 525 x 500 KM) may top Proteus however, we may find out if the GAWN spacecraft gets a 2 Pallas flyby in December 2018, after the primary mission @ 4 Vesta & 1 Ceres is over. Yes, this image is also one of my favourites from the mission. Then again I would say that as I find Dione a most fascinating (possble past cryovolcanism) & visually stunning object. This superb image in my opinion, is very revealing. Dione is seen here displaying a multitude of terrains. Four main points I noticed. 1). The northern region on the terminator. To me that area looks fairly 'recently' resurfaced. General lack of craters, furrowed appearance, looks like an expansive cryovolcanic lava plain. 2). The canyons. Particularly those at the bottom right. Did the crust crack when the icy mantle beneath froze & expanded beneath an already brittle ice crust? This looks similar to what Voyager 2 imaged on the Uranian moon Ariel & I also suspect DAWN may find at dwarf planet 1 Ceres. Would be interesting to see those canyons at high resolution. Look like graben to me. 3). Tall central peaks in some of the larger craters. Rebounding crater floors, nothing unusual there per se, but on Dione seem to be very pronounced, more so than on the other moons. Also evidence of a softer mantle beneath a brittle crust. 4). Irregular crater density. Similar to point 1, but some areas seem deceptively smooth, rather than furrowed. Diapirs perhaps? I know I have made a few posts today, but I am new & have a lot of ideas / observations I would like to share & talk about. It is great to see that Dione has a major part to play in the extended mission. Can I request the pass to be as close as possible? One question I do have, is there any info on the potential interior of Dione? I suspect Dione is differentiated, with a definate core, mantle & crust. Has tracking of Cassini, revealed anything of that nature during the close pass way back on Tuesday 11th October 2005? I suspect that Dione had a 'mantle' of softer ice beneath a harder ice crust at some point. filling in the void & that the 'mountains' are compressional features from the refreezing of the basin. It would be very interesting to get a close pass above this feature & see if flow like features exist in the basin. the smoother areas of Dione. Most of these smaller moons appear to be 'rubble piles' of ice & maybe rock. Epimetheus, Janus, Hyperion, Telesto, Calypso, Polydeuces, Helene, etc. Phoebe appears to be more coherent, but then Phoebe most likely formed elsewhere, maybe the Kuiper Belt, got ejected & then captured by Saturn later on. The other smaller Saturn moons & Jupiter's Amalthea, appear to be rubble piles held together by gravity. We have been finding evidence of ongoing geological activity on more & more planetary bodies, since active volcanism was discovered on the Jupiter moon Io by Voyager 1. Enceladus (love this image by the way). I think it is Saturnshine & yes Enceladus isseen here in front of the E-Ring, its own making, hence the 'bright' background. Enceladus has joined the illustrious list of active bodies, with Titan, Dione, Jupiter moon Europa, Uranus moons Ariel & Titania, Venus & maybe Mars, being evidenced as being only 'dormant or even active'. Even MESSENGER @ Mercury recently has revealed interesting volcanic geology on the newly viewed part of the planet. Enceladus is one of my favourite planetary bodies & along with Titan, Dione & Iapetus ranks as my favourites of Saturn's moons. I for one an eagerly awaiting the very close Cassini encounter this March. What may help, is a close pass over the older northern region, to get close imaging & gravity data & then compare with the active south polar region, perhaps this may help explain, why the activity is clustered around Enceladus's antarctic & not more globally like Jupiter's Io. Phoebe, is also very interesting, as maybe a captured KBO & thus Cassini may have trumpted New Horizons, in first encountering a KBO.